Currently, all IAPLC companies are also ILDA Members, although it is possible for non-members to apply for and receive IAPLC accreditation. Note: ILDA Professional accreditation ultimately means that a company has submitted documentation indicating that they meet the IAPLC program's criteria, and has paid fees covering program and marketing costs, plus ILDA operations. Accreditation does not cover business practices or non-laser display work, and is not necessarily a guarantee of quality or satisfaction. 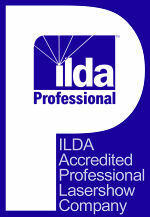 ILDA does not run or monitor the operations of those achieving accreditation. Persons hiring any laser display producer should check business references, review past shows and take other prudent steps to ensure a good fit between the client's needs and the laser company's experience.